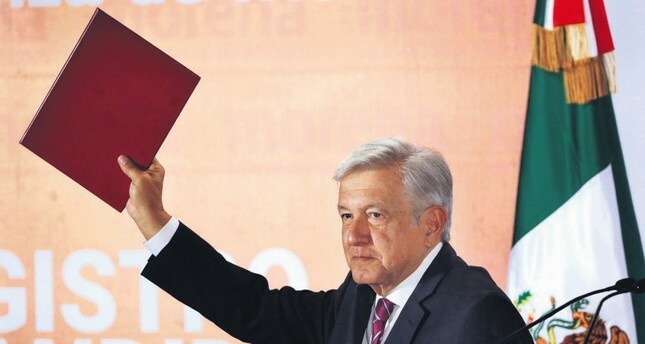 Mexico's President-elect Andres Manuel Lopez Obrador, more widely known as Amlo, holds up his candidacy application for the July 2018 elections. Right now Mexican President-elect Andres Manuel Lopez Obrador, who is scheduled to take charge on Dec. 1, is passing through the most testing time of his political career, perhaps more taxing and challenging than actually running the affairs of government. With each passing day, speculations are being concocted by his supporters and detractors alike about his future policy and long-term agenda. This is a very natural phenomenon for any president-elect who has to wait for five months to take charge after winning the vote. Over 30 million Mexicans voted in the country's July 1 presidential election to elect him as the next president with the clear cut intention to transform their traditionally conservative Latin American nation into a progressive country free from drugs, violence and poverty. Obrador, a silver-haired 64-year-old who is best known as "Amlo," secured almost 53 percent of the vote, while his closest rival, Ricardo Anaya from the National Action Party (PAN), received around 22 percent and José Antonio Meade, a career civil servant running for the Institutional Revolutionary Party (PRI) which ruled Mexico for most of last century, came in third with around 16 percent. "I will govern with rectitude and justice. I will not fail you. I will not disappoint you. I won't betray the people. We will listen to everyone. We will care for everyone. We will respect everyone," vowed Obrador. Certainly very positive and reassuring words from a person, who had made two failed attempts to win on similar platforms in 2006 and 2012. This year, however, in order to ensure victory, Obrador's young Morena party joined forces with several smaller parties from both the right and left to build a triumphant but strange electoral coalition called "Juntos Haremos Historia," or "Together We'll Make History." Interestingly, the amalgamation of political parties of all shades and colors that is responsible for his electoral victory may also become the reason of his failure to execute his agenda. The people now meant to form the core team charged with turning Obrador's pre-election promises into reality when he takes office in December, will come from wildly disparate backgrounds, including social progressives, pragmatic business tycoons, evangelical Christian and committed Marxists. The coalition has also accommodated high-level defectors from all three mainstream Mexican political parties, including the PRI of the outgoing current president, Enrique Pena Nieto. There is no doubt that the Mexicans have piquantly penalized Nieto and his PRI for nurturing a culture of corruption, allowing deep inequality to fester and letting ferocious violence thrive in Mexico. The PRI, which ruled uncontested for almost a century, was running the country as a powerful and robust political entity with tentacles spread all over the silhouettes of Mexican society until the calamitous presidency of Nieto, who is finishing out his six-year term. The PRI was also authoritarian and used all kinds of despotic tactics – dissidents disappeared, student protesters were gunned down and journalists were bought off. In 2000, Vicente Fox of the center-right PAN became modern Mexico's first non-PRI president. The PRI soon bounced back to power by putting Nieto in office in 2012. Despite being a career politician, President-elect Lopez Obrador is being labelled as a political outsider – a distinct feature that also helped him in registering his electoral victory. Like most Mexican politicians of a certain age, he was once an active member of the PRI, from 1976 to 1983. He understands exactly how the PRI dominated Mexican politics for so long. A baseball-loving left-wing nationalist, Amlo has vowed to crack down on corruption, rein in Mexico's war on drugs and address socioeconomic degradation. There is nothing new in this agenda. Every Mexican wants this to happen. Mexico is in a deep mess and an overwhelming majority of Mexicans have pinned their hopes on him. His immediate challenge is how to build his team, while maintaining a balance among the divergent partners of the alliance. He has contemplated a risky venture by concocting a hybrid political machine designed to stitch together powerful political elites regardless of ideology. But he has already started feeling the pressure from different sides within his alliance with regard to the formation of government structure. In an effort to reinforce his status as a powerful head of state, a group of his aides are lobbying a transformation of Mexico that will not be possible without rewriting the constitution. But this idea is not likely to gain momentum in the near future because the compulsions of keeping the alliance intact will keep Obrador from venturing in this direction in the early phase of his stint. His motley coalition, which is responsible for his emphatic electoral victory, has all the ingredients to become his biggest liability as well. We must expect a lot of infighting – between now and his inauguration on Dec. 1 – but this internal squabbling will be crucial in deciding how the Obrador government will look and what its priorities will be in the initial days. Corruption, violence, drugs and poverty. Colossal challenges. And it will require a long-term, phase-wise and comprehensive plan to bring about the desired transformation of Mexico as per the aspirations of the people who are exhausted to the brink of collapse. It also entails that his focus will be more on the home front rather than external affairs. Though some left-wingers of Latin America are expecting his ascension to power will revive the region's rapidly ebbing "pink tide," but we should expect a less active Amlo in regional and global politics.